The 75th Annual Dolphin Show, Little Shop of Horrors. The Dolphin Show logo before it was redesigned by John Allman (2013) for the 70th Anniversary in 2012. The 73rd Annual Dolphin Show, Titanic. In 1939 a group of Northwestern University men interested in developing their swimming talents formed an elite group called the Dolphin Club. They swam hard and won competitions all over the Chicago area. In 1940 an opportunity to compete in a Florida meet prompted the men to hold a swim carnival in order to raise money so their 15-member team could travel south for the meet. Both the carnival and the meet were so successful that the Dolphin Club repeated its efforts the following year. With the aid of experience, new features were added and the quality of the water show improved. By 1942 the popularity of the Dolphin Club's show had grown. The effects of World War II forced the cancellation of the annual Waa-Mu show, another popular musical at Northwestern. Dolphin Club members used this opportunity to combine their tradition with some of the original student talent that had been the Waa-Mu show and presented an evening of song and dance. Unfortunately, due to the wartime economy, the newly named Dolphin Show was canceled as well. The Dolphin Show resurfaced in 1944 with the musical revue entitled "Wela Kahau." The production showcased the aquatic talents of the women's water ballet and the men's Dolphin Club. The proceeds from this show went to buy war bonds. By 1948 the tradition of the show was strong, and the audiences returned to see the musical-comedy revue which took place around the pool of Patten Gymnasium. A team of designers and other staff members mounted the show in order to, once again, send the Dolphin Club to Florida. As time progressed club members found that the show ventured further and further away from its original aquatic roots. In 1949 the Lorelei Club, a female swimming club, joined the Dolphin Club's efforts to produce the Dolphin Show. With the addition of this group, the Dolphin Executive Board came into being. The board gave equal representation to both clubs in decisions concerning materials and budgets. Each year the clubs chose a theme around which the show would develop. The year 1963 brought the first Dolphin Show in which the play around the pool was an event itself, not serving as a fund-raiser. A year later, the 1964 Dolphin Show was still trying to get out of the water. Gilbert and Sullivan's "The Mikado" was presented around the pool. In 1970, the musical "Mame" finally graced the Cahn Auditorium stage. Those students currently associated with the Dolphin Show are proud of its rich history. Few shows can boast such a colorful background or such successful alumni as actors David Schwimmer, Warren Beatty and former Miss America Kate Shindle. Click here to download a more in-depth history! Want to learn more about The Dolphin Show? 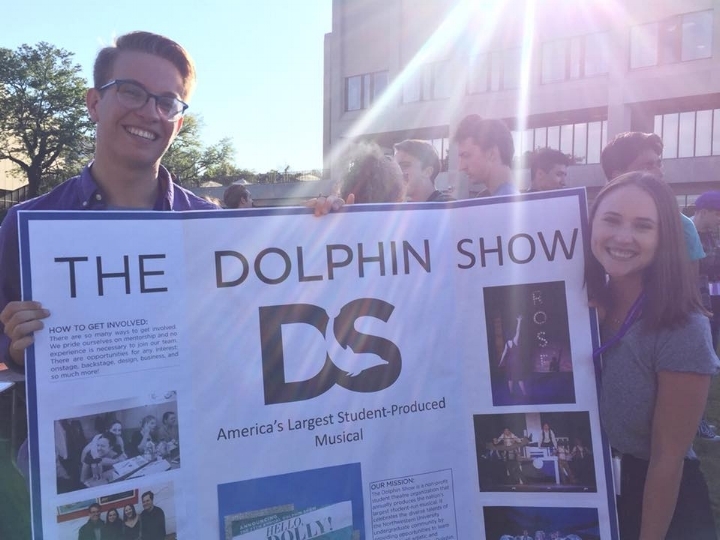 Whether you are a Northwestern student, a Dolphin Show alumna, or a supporter of the arts, we would love to have you on our team! Please email producers@nudolphinshow.org or click the Contact Us link above for more information about how you can get involved with and support the Dolphin Show tradition. If you are a Dolphin Show alumna and would like to know more information, please email Andrea Canizares-Fernandez at alumni@nudolphinshow.org.